I have an uncomplicated relationship with singing (not that anyone ever asked). I do it when no one’s around. It’s a simple rule that I find easy to follow. Now that’s a full-body song! I don’t need a second opinion about my singing ability or any of the other performing arts for that matter. Something tells me I have a good idea. I still recall with some horror finding myself playing a piano in front of a live audience as a young child. I was trying to make it through some quant little number that undoubtedly would have bored me beyond belief if I had the good fortune of being in the audience. But I wasn’t that day. I was so nervous, my fingers rattled back and forth hitting the sides of the keys beside the ones I had depressed. Mercifully the episode came to an end after what seemed like a few lifetimes. With experience comes experience. If I’m going to do anything with an audience, I certainly don’t need a live one. Photography on a blog works rather well that way. Given my audience-averse perspective, I am always bemused at wildlife that is quite happy to sing while someone is watching. I thot I would post a few for your watching pleasure. I have to admire their bravery! Click on any image below for the gallery view. A cormorant belts out a lonely song from across the lake. Even the bear managed to take time away from eating to whistle a tune. There’s nothing quite like a four-legged duet hitting the high notes. Perfect photos for the theme, loved ’em! I imagine the moose crowd carries quite the tune but they wouldn’t touch these guys! I love this collection of singers…. an interesting way to combine different species in one post, &, i really like the disappearing captions, very classy! I keep trying to find creative ways to put photos together with posts – glad you thot this one worked out. That Yellow-Headed Blackbird looks like he’s belting out a beautiful aria, but we know it’s just the most god-awful croaking rattle! There’s a message there, I think. Like this post a lot. Definitely a message there – had me chuckling. You gotta love the attitude. I recently recorded three minutes of birdsong in my garden. The song lasted much longer, but I only decided to capture the serenade when it seemed it would go on forever. It did not. But it was lovely while it lasted. 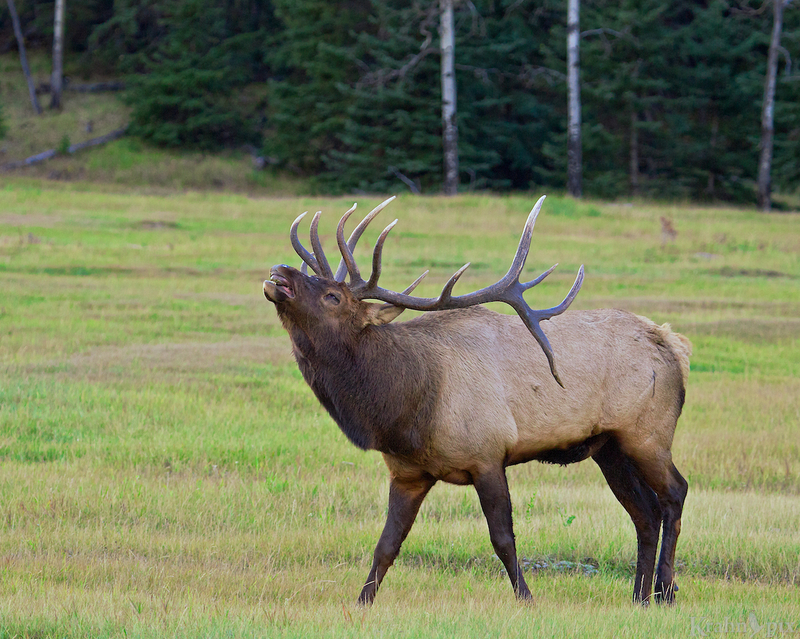 Elk bugling season in Rocky Mountain National Park is one of my favorite memories of living in Colorado. Nice pics! Three minutes is still a long time. The sounds of nature including that bugling make life so much richer. I have a similar arrangement with singing except one step further…I don’t. Even I am offended by mine. Now if only we could be lacking in self-consciousness as your subjects then that would be different. It’s fascinating when people or animals lack self consciousness – there is a freedom there that brings out amazing things. No singing talent here either. The cormorant really is a neat photo. I never saw one do that from that height. 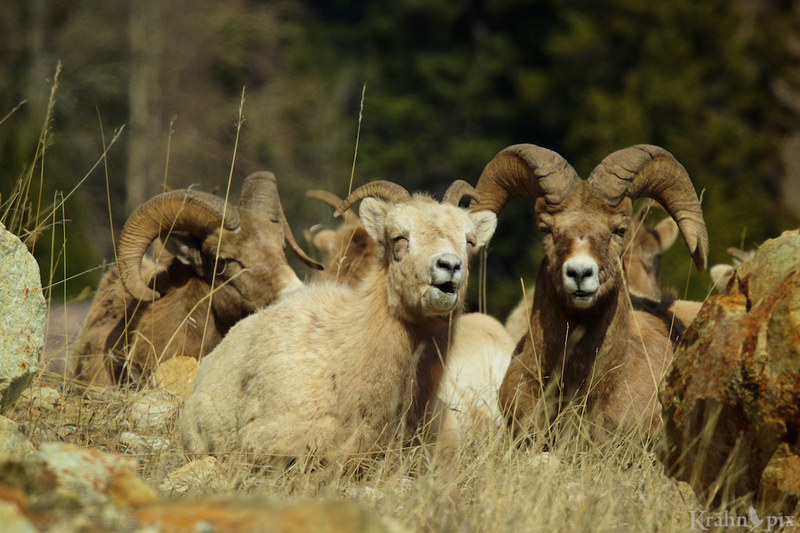 My favorite image is the bighorn sheep. Just a friendly duet i am guessing. Sheep really do have funny expressions and I just loved the casualness of them hanging around. I was initially disappointed that I was so far away from the cormorant (a lake separated us) but it does provide some sense of space. That’s funny. The rooster sound is one of those memorable ones. I used to do a reasonable imitation – that’s about as close as I ever got to singing well. Oh, those childhood traumas from performing in public-glad you survived to tell the tale. I love the songs of the birds, everything comes alive when they arrive, although my neighbour wants to shoot the house finches that nest outside his window. I like to sing, although my voice at times is similar to the yellow-headed blackbird-a little off, even raucious when my asthma meds are giving me grief.Like your photos and the expressions – find it fascinating to hear that all these animals /birds have a voice. Wouldn’t it be nice if we could all sing like birds? Ah a person can dream. Fantastiche, foto stupende. Complimenti, bellissime!! Grazie. Ho avuto la fortuna di essere in grado di catturare i momenti. Ecco, non sapevo che parli pure l’italiano. Bellissime foto come al solito! Sono solo felice il software di traduzione funziona abbastanza che l’italiano è comprensibile. I’m with you on this one. I don’t even like to hear myself sing… audience or no. That’s why they have experts in the field who have made recordings that I can turn on loud enough to drown myself out! Sounds like a great ad. Beautiful shots, Lyle. Matt and I were getting a kick out of an Indigo Bunting just the other day that was singing in a meadow. He was throwing his head back, dropping his lower beak and really getting into delivering his song. Unfortunately, he was a little too far for good photos, but we did admire his gusto! Too bad you missed the photo but your description of the gusto lives on. I love the way creatures through themselves into those activities. There was a house wren sitting outside my study window, singing its guts out this morning. I am grateful that the survival of the human species does not depend on one’s singing abilities to attract mates. My family would have died off generations ago, not an American Idol among them. Excellent point about singing for mates. I shudder to think at the possibility of trying! !